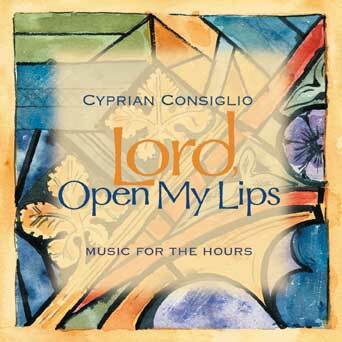 Cyprian Consiglio, OSB Cam, is a monk of the Camaldolese Congregation, musician, composer, author and teacher. Much of both his music and his teaching revolve around the Universal Call to Contemplation through spirituality and the arts. Cyprian offers concerts and workshops focusing on music for prayer and contemplation. He performs solo, with his own guitar accompaniment, and with percussionist John Pennington, who specializes in hand drumming and world music. Designed for cantor and assembly, this resource provides musical settings for morning, daytime, evening and night prayer, with performance notes and music by Father Cyprian Consiglio. The collection includes an enlightening and scholarly foreword entitled "Celebration of Communal Prayer in Cathedral, Parish and Domestic Church." The article covers the history and theology of the Hours while advocating their use in churches and homes. This 13-song CD features music for contemporary ensembles and piano, guitar and percussion groups–uniting the sound of contemporary Christian music with the rich tradition of the liturgy. Its combination of musical styles, including Afro-Caribbean, gospel and Americana, is liturgically accessible to the assembly as well as the performers. Built on buoyant, soaring melodies, sublime poetry and layers of intricate percussion, the 15 songs on Awakening capture the sweet innocence of morning, the welcome relief of spring, the joy and playfulness of childhood. The texts are wonderfully eclectic, drawn from the psalms, the saints and secular poets grounded in mysticism. John Pennington brings his usual masterful percussion, backing Cyprian's rich vocals with a mesmerizing array of bells, chimes, gongs, wood blocks, shakers, marimba and congas. It's an exotic sound, mirthful, tropical and calm, with warmth and depth added by well-arranged parts for cello, guitar, flute and other instruments. Cyprian and John put it best: "Could the length of a day be a metaphor for the journey of the spiritual life? The initial jubilance of first awakening giving way to the earnest work of enfleshing it in all our affairs, however mundane they may seem to be. The crossing through the noonday devil of the desert, when discipline must remember desire. The warm darkness of mystery, when facile answers fail and a new way of knowing beyond knowing comes to the fore. When our thinking fails, we are called to put love first. When words fail, we fall into the place where everything becomes music." In this upbeat collection, Cyprian explores new themes from ballads to blues with captivating melodies sure to surprise and delight any listener. With an eclectic blend of styles, Behind and Before Me builds a bridge between contemporary Christian and liturgical music. Join Cyprian and John for an exotic musical journey from the tropical coasts of Africa and Brazil to the heights and depths of the soul. Featuring a playful, richly layered world-music sound, Compassionate and Wise offers 12 new, original songs that explore mystical poetry from around the globe. At turns whimsical and philosophical, surreal and profound, the texts reflect a range of cultures and spiritual traditions, from Hindu to Christian. Poets include St. Thomas Aquinas, Maya Angelou, Frederico García Lorca and the Chinese Buddhist Metta Sutta. Three of the most enchanting songs are set to poems by Hafiz, the great Sufi mystic. The Day Sky presents a striking image of humility, asking Let us be like/ Two falling stars in the day sky/ As we hold hands with God/ And burn. The title track touches on the healing power of unity: Because our hearts are one/ this world of pain turns into paradise./ May all become compassionate and wise. Good friends and great musicians, Cyprian and John have worked together on six previous recordings, including Awakening and The Song of Luke. This collaboration features Cyprian on acoustic guitar, lead vocals and, on some tracks, the lute-like tambura. Bassist Bryan Kuban, vocalists John Mareineke and Shannon Frediani, and violinist Mikylah Myers McTeer provide accompaniment. A percussion virtuoso, John plays a mind-boggling array of instruments here, from finger cymbals to bodhram (Celtic frame drum), from maracas to glockenspiel. Others include the riqq (like a tambourine, used in Arabic music), mbira (a wooden board with staggered metal keys, from Africa), cajón (a box drum, from Peru), crotales (antique cymbals), vibraphone, marimba, and wind chimes. Each adds its distinct voice, rhythm and musical color to the songs. Musician, composer, author, teacher and monk. Cyprian Consiglio is a man of many dimensions, but his music and teachings revolve around one central theme: answering the Universal Call to Contemplation through spirituality and the arts. Echo of Your Peace gathers songs from a rich tapestry of music spanning 25 years. This diverse collection includes tracks from his first album (There Is a Light), all three of his projects with longtime collaborator John Pennington, as well as compositions recorded specifically for this compilation. Full of tight harmonies, "There Is a Light" gives the album a soulful a cappella opening. "Echo of Your Peace" showcases Cyprian's incredible vocal range in a powerful, soaring plea. Text drawn from Harriet Kolfak's poem is beautifully brought to life in "Awakening." "Sab Bhole" features masterful acoustic guitar work that acts as extended meditations on the lovely mantras of this Hindi song. East meets west in "Spirit in the Cave of the Heart," as bluegrass acoustic guitar exists in harmony with chanting of the English translation of an Indian bhajan. This collection is a powerful reflection of Cyprian's great love for comparative religion. A distinct turn to the East, both musically and spiritually, can be heard halfway through the CD. Echo of Your Peace provides both new and longtime fans an album that captures the variety of musical styles Cyprian employs to sing of hope, peace and healing. What do you get when you put a Camaldolese monk known for his experimentation with chant forms and a world-class percussionist/music professor together in one room? You might end up with In the Heart of the Desert, a collection of music that crosses boundaries to find the sacred sound at the heart of the spiritual journey. This collection is a mix of instrumentals and songs with rhythms from around the world. The song texts are drawn from a wellspring of ancient sacred sources -- Buddhist and Hindu as well as Christian. In the Heart of the Desert features an array of unusual percussion instruments including the mbira, crotales, caxixi, shekere, congas, Filipino buzzing sticks and many others. Designed for cantor and assembly, this 31-track resource from Cyprian Consiglio, OSB Cam provides three hymn tunes and a host of musical settings for morning, daytime, evening and night prayer. Recorded within the splendid acoustics of the chapel at New Camaldoli Hermitage in Big Sur, California, this new collection of chant draws the listener into the peace of the monastery with its simple and meditative tones. The 27 hymns, prayers and psalms -- most of them chanted in English -- follow the community's singing of the Sunday Liturgy of the Hours, including Vigils, Lauds, Vespers and Compline, which closes with the traditional Salve Regina in a Gregorian mode. The 22 Camaldolese Benedictine monks perform a style of plainsong, or a cappella chant, that is based on Gregorian chant, but with variations that are unique to the community. Because of their ties to eastern monasticism, they also employ some chants based on the Byzantine style in two and three part harmony, such as in the opening "Trisagion: Holy God" and in the exquisite "Our Father," a beautiful arrangement of a Rimsky-Korsakov composition. New Camaldoli Hermitage is the home of Cyprian Consiglio, OSB Cam, who was involved in the production of O Day of Resurrection. This 12-song CD of contemporary sacred music blends jazz, reggae and rock. The recording is suitable for retreats, days of prayer, or to support the growing faith of people in their daily activities. "What I have always loved about the Gospel of Luke is that everyone seems to burst into song. In these songs are contained the four great Gospel canticles of the Christian liturgical tradition." Capturing a stunning live performance of the oratorio from Cyprian's collection The Song of Luke, this DVD provides a moving meditation on Luke's Infancy Narrative. Contemporary melodies combine with vibraphone, harp and piano, as Gospel characters are brought to life in divertissements by solo instruments (oboe, clarinet, bassoon and cello) and liturgical dancers. Cyprian masterfully weaves together Luke's Gospel narrative for the Advent/Christmas season with the Canticle of Zechariah (Benedictus), the Canticle of Mary (Magnificat) the Glory to God (Gloria in excelsis Deo) and the Canticle of Simeon (Nunc Dimittis). Whether performed as a program or used for personal prayer, this resource offers a powerful reflection on the birth of our Savior. Featuring captivating performances by the Choir of Augustana College and the Department of Performing and Visual Arts, this beautiful re-enactment also showcases Cyprian singing the role of the Narrator, in addition to John Pennington on vibraphone and a variety of percussion instruments. 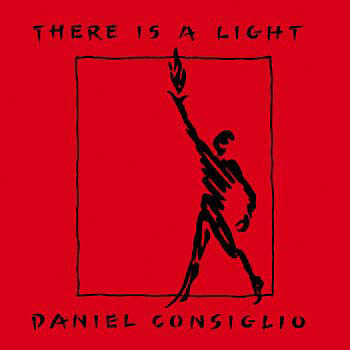 This guitar accompaniment features chords and vocal parts for the music album There Is a Light by Cyprian Consiglio, OSB Cam. 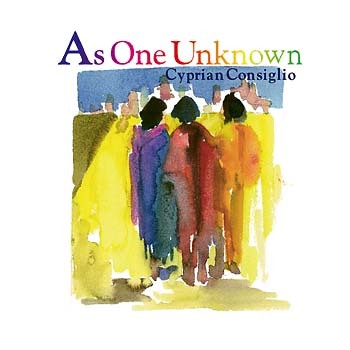 This accompaniment features keyboard, guitar, oboe, cello and vocal parts for the music album As One Unknown by Cyprian Consiglio, OSB Cam. This is the MP3 playlist for Behind and Before Me, by Cyprian Consiglio, OSB Cam. Cyprian Consiglio, OSB Cam, grew up near in Illinois and later spent years living in Phoenix, Arizona, where he worked as a professional musician, performer (guitarist and vocalist), arranger and producer. He earned his master’s degree in theology from St. Johns Seminary in Camarillo, California, and was ordained in 1998. A student of the writings of Bede Griffiths and Abhishiktananda, Cyprian has a great love for comparative religion and he has been to India several times to study and teach. 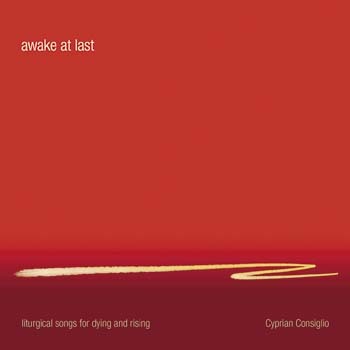 Along with his six collections of original music recorded and published through OCP, Cyprian released three others through the Equilibrium label with his longtime collaborator, percussionist John Pennington, as well as two other collections self-published out of Singapore. The Equilibrium collections are titled Awakening, The Song of Luke and Compassionate and Wise. Another collection to his credit is Wait, My Soul, In Silence, music for meditation created in collaboration with Laurence Freeman for MedioMedia. He has also collaborated on several collections of a capella sacred music for the church year with the Collegeville Composers Group. 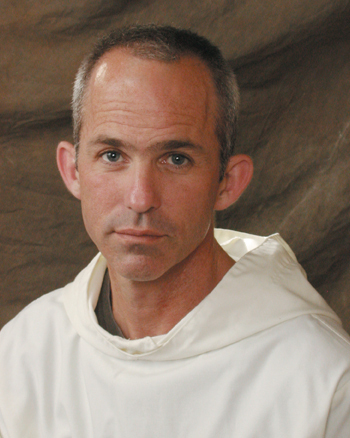 Cyprian is prior of the New Camaldoli Hermitage in the Diocese of Monterey in California.